As most of you know, that means "please respond" in French. 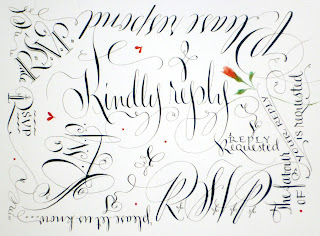 As a calligrapher, I have written this more times than even I can imagine. 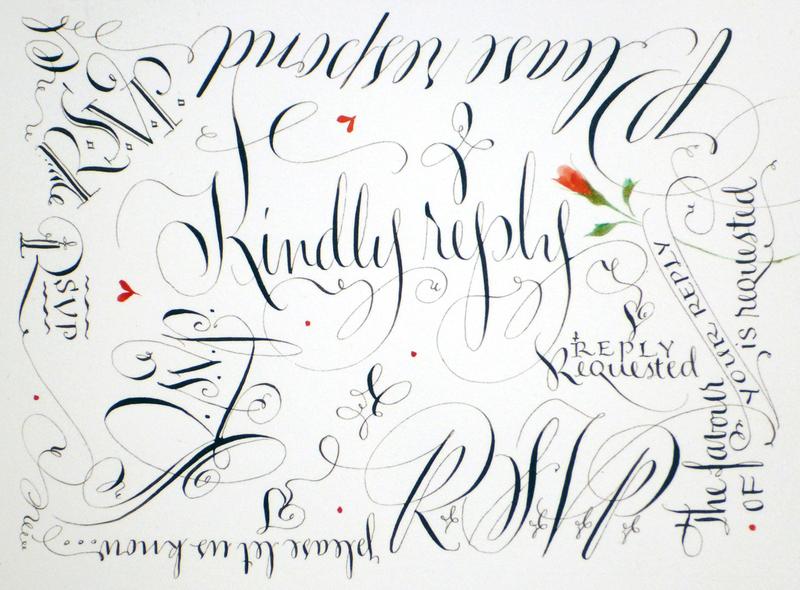 Over the years of lettering wedding invitations, designing sometimes four or five sets per day, I was always looking to get a little creative with how I might letter it - not only the language, but also the visual aspect. I rather enjoyed challenging myself to doing a repetitive task differently each time (see blog about bed making!). But this was way more fun and I just spent a bit of time of time to put together some samples. Actually it only took her about 10 minutes to do that RSVP assortment. Of course, she's been doing this for over three decades! But now, this acronym has a whole new meaning for us . 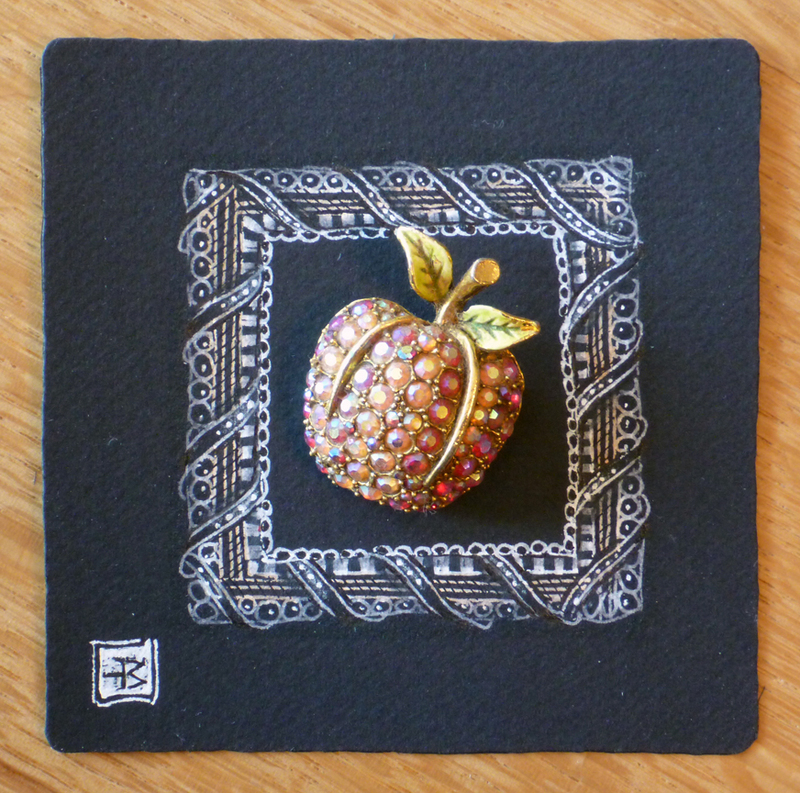 . . as we invite all of you to respond to our blog posts (and with the occasional added incentive of a piece of original art). We are so grateful for your comments. How else will we know for sure that you understood what we intended to convey? How else will others believe what we say? It's wonderful . 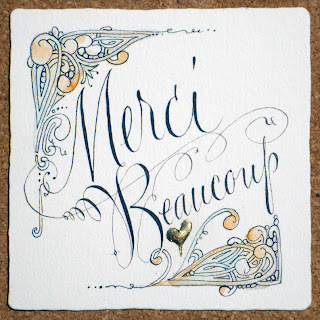 . . when you réspondez to our s'il vous plaît. 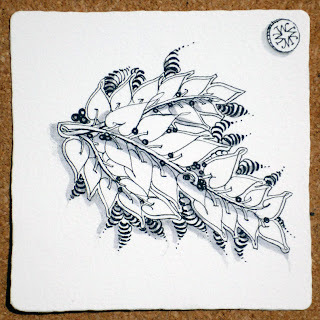 Congrats to Sinda Wood for being chosen to receive a tile for commenting on our previous blog post. S'il vous plaît, click images for larger views. My thoughts were wandering recently (actually they wander quite often, without my consent or direction). 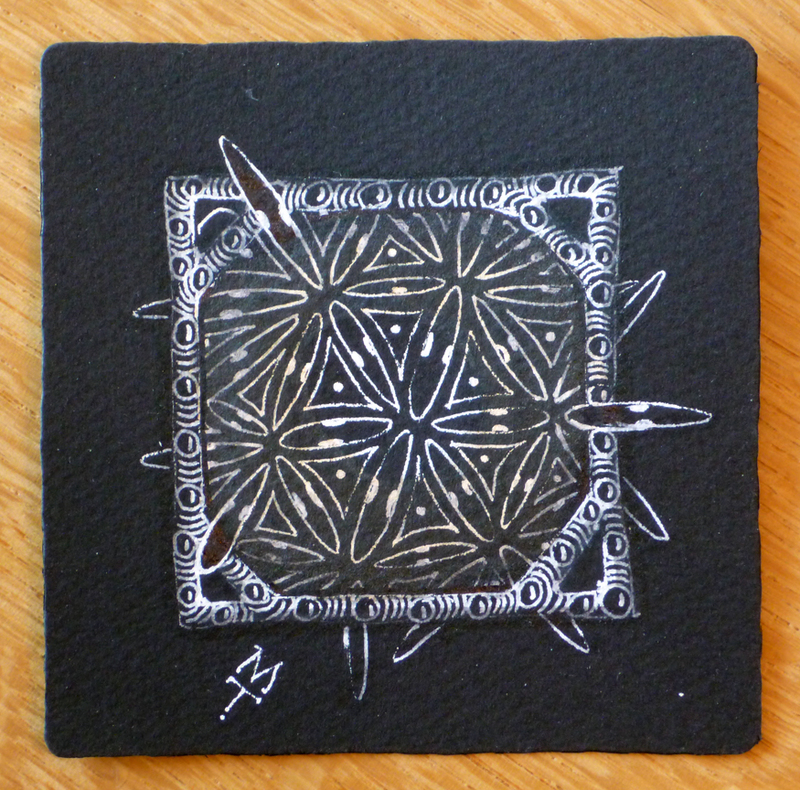 I was trying to figure out just why Zentangle immediately gets me into that mindfulness state, when other art forms I practice do not. 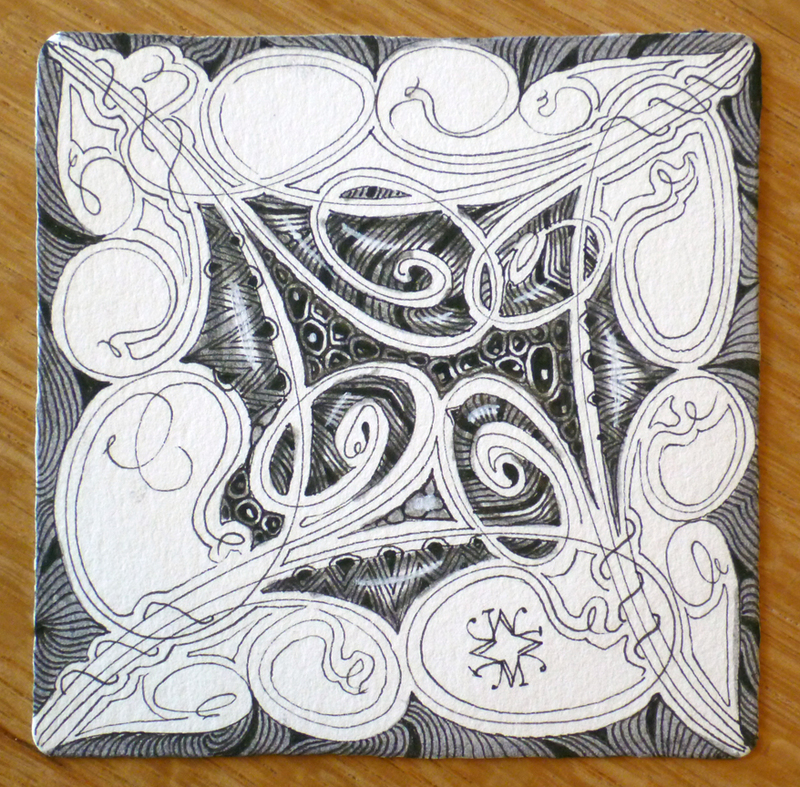 What's different about the Zentangle Method? 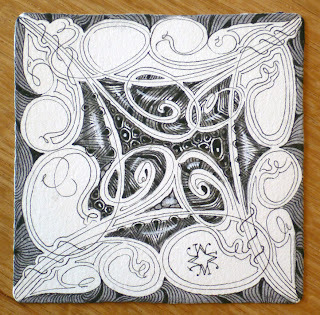 I was thinking about the abstract-ness of it all, and that when I'm actually tangling on a Zentangle tile, I do not distract myself by looking away from my artwork for reference, confirmation or even inspiration. Earlier I may have been looking . . . here and there . . . this way and that . . . for inspiration. 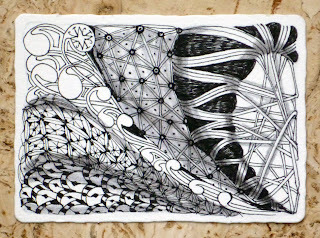 I frequently add to my Zentangle "field notes" journal as I explore new tangle and deconstruction possibilities. 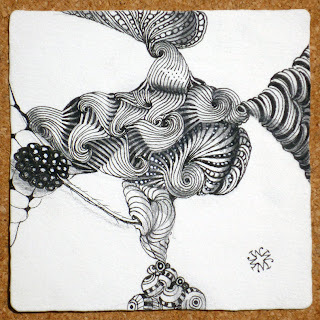 But while I'm tangling, I just look at my tile. I'm not looking back and forth between my art and model, or at a photograph I'm trying to imitate, or admiring and trying to capture the momentary magnificence of a changing landscape or seascape. 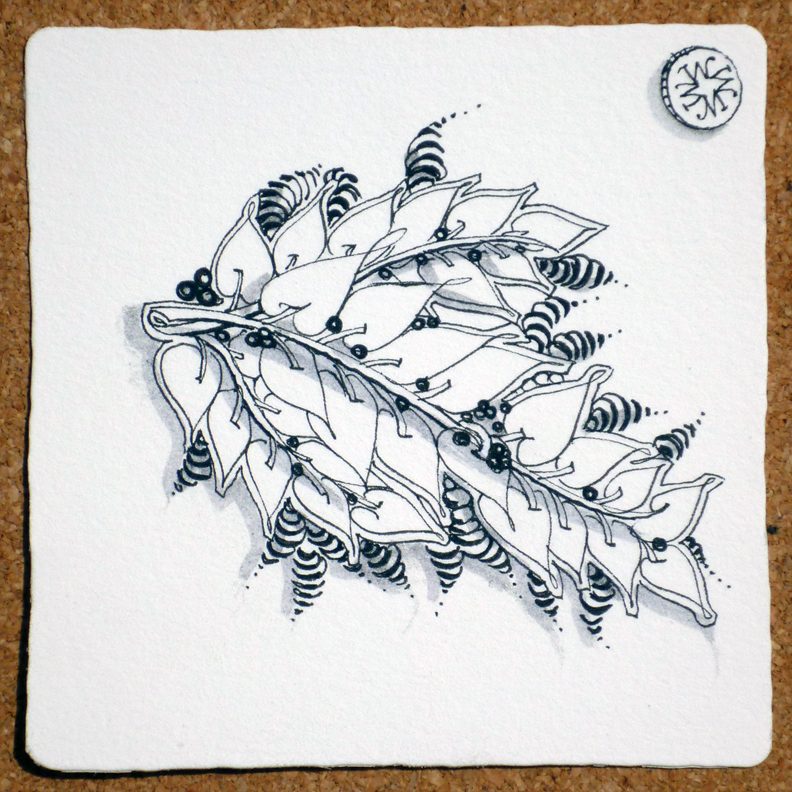 When I sit down with a blank tile, I like to have an idea of the tangles I might use. I usually start out with one of my "mac 'n cheese" tangles, you know . . . "comfort tangles." Some of mine are mooka, purk, tripoli, poke leaf and maybe a bit of bales . . . old standbys. When I get a rhythm going I might throw in something different, maybe a new one I have seen in passing or a tangleation of one of Rick's (making his straight lines a bit curvier! :-) or just some auras around to elaborate existing tangles. But while I'm tangling, I just look at my tile . . . I rarely ever look up. 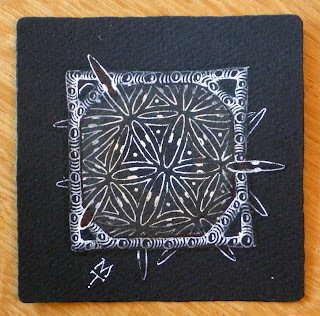 Perhaps this uninterrupted concentration/focus on one place is one of the ways Zentangle works its magic for me. Last week we were talking with visitors about when Maria and I had our a-ha moment that became Zentangle. 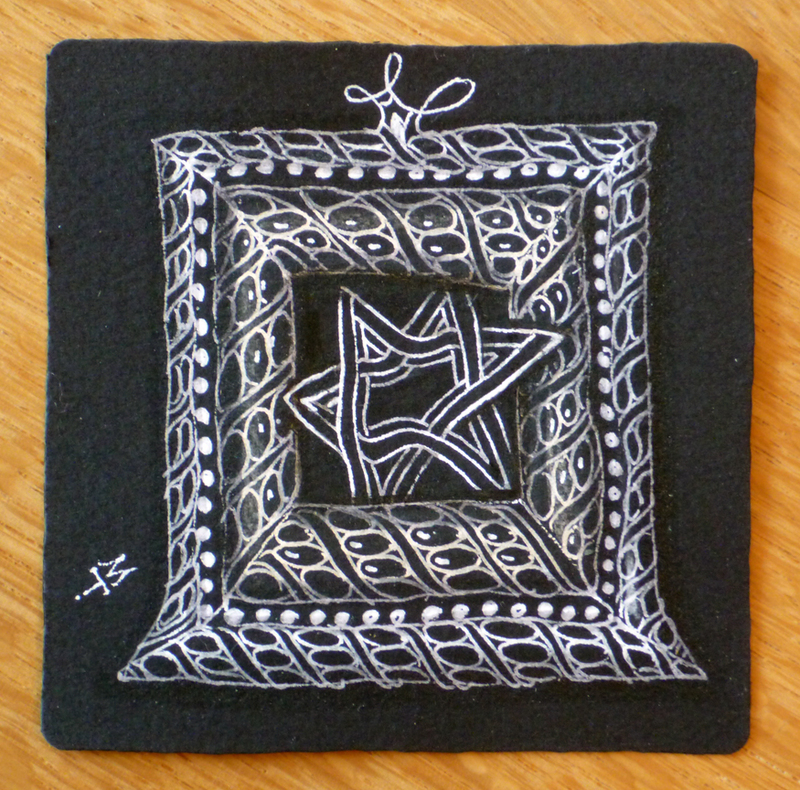 Our motivation to develop and share the Zentangle Method was not that it enabled her to create beautiful art - that was expected. 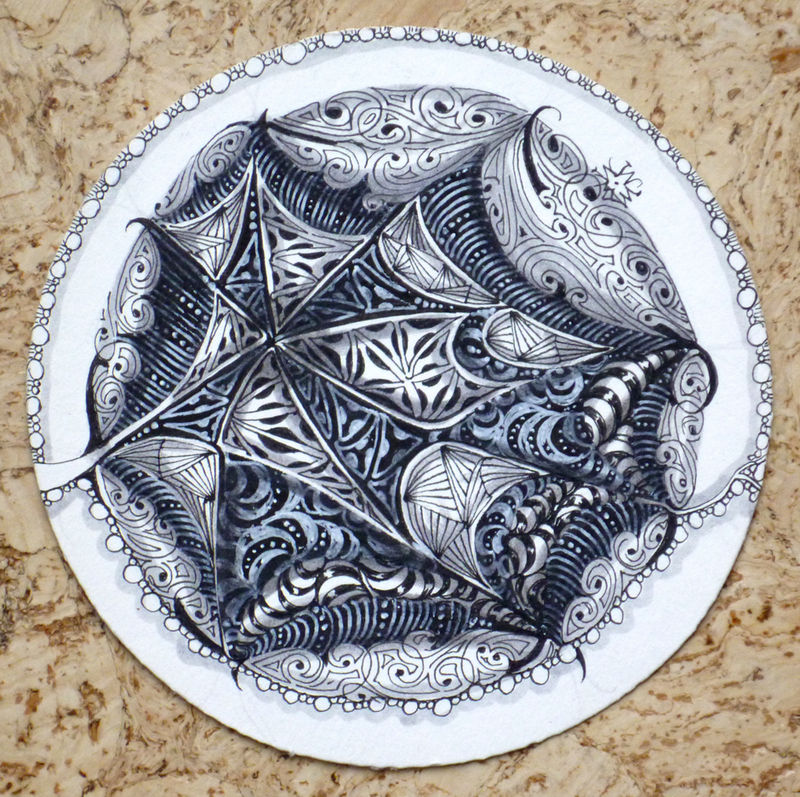 It also wasn't the idea that it might enable almost anyone to create beautiful art. Although important, I don't think that would have been enough to convince us to begin a whole new adventure while maintaining our regular work. No, what convinced us was the significance of how Maria felt. We thought that if others could feel that good and just as easily create beautiful art . . . that would be a worthwhile adventure! 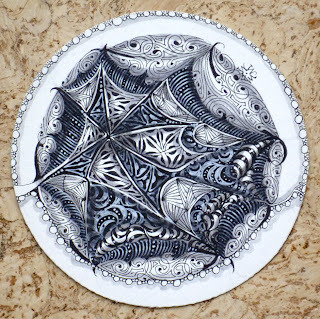 While Zentangle art is usually abstract (nonrepresentational), it is not an abstraction (something that exists only as an idea). Its results are beautiful to see; its experience, beautiful to feel. So, what about you? 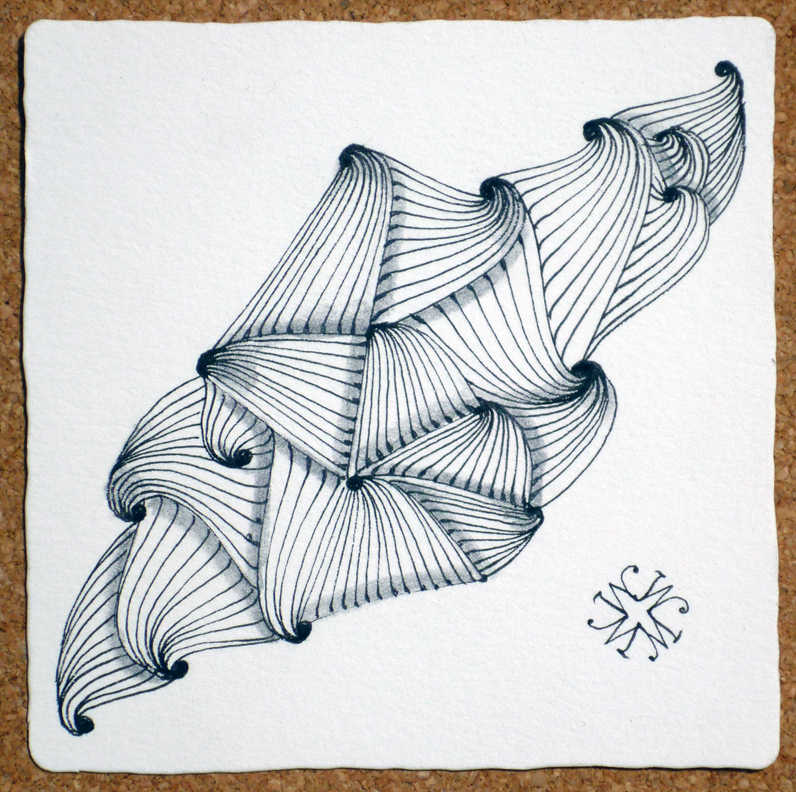 How do you think Zentangle draws you into that Zen-Zone of mindfulness? 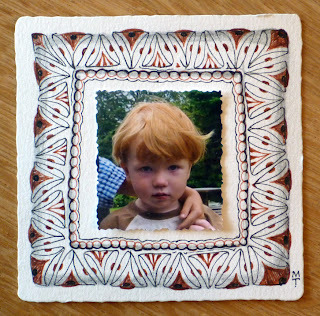 Share with us and we'll send one of these tiles to one of you. I use a random number generator to choose a winner, just so you know. And please! Give us a way to contact you. We love sending surprises out. Life is good. Winner from "When's the last time?" is Lara Williams, CZT. 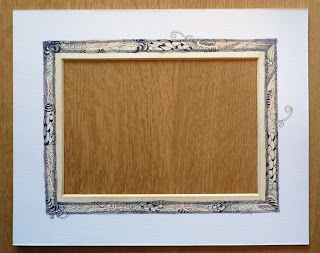 Winner from "Frame of mine(d)" is Anneke in Netherlands. Congrats . . . they're on their way! When's the last time . . .
. . . you did something for the First Time? It seems a silly question, but it's fun to ponder. . . The first time I went up in a hot air balloon comes to mind . . . (with my daughter Molly and my sister Sue in Mexico). This morning, when I created . 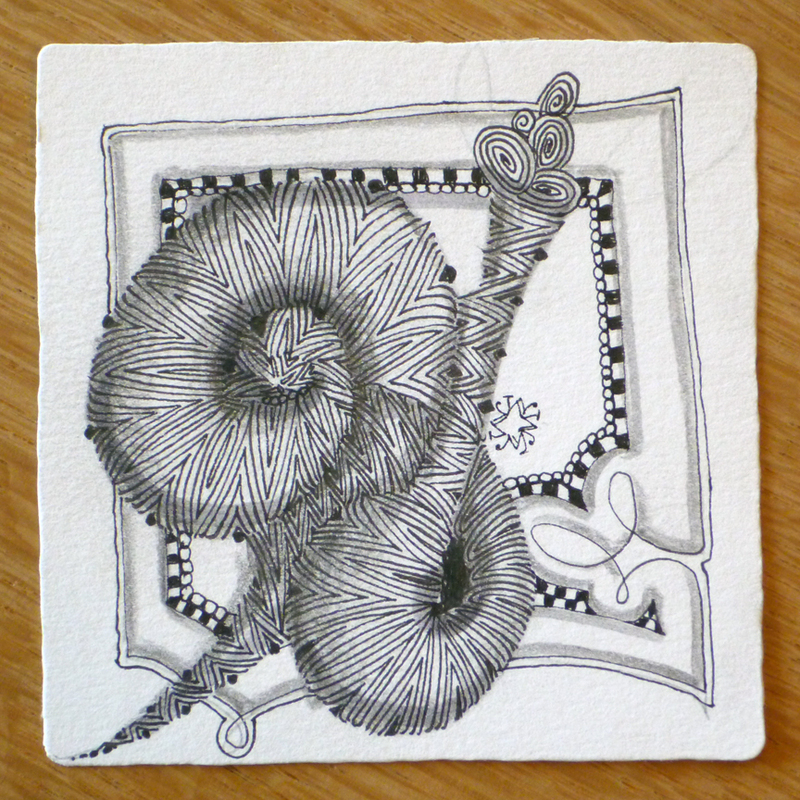 . .
Then I asked the girls in the Zentangle office. Mary Lou said she had made a lemon mousse recently for a party for the first time and, thankfully, it came out great. Daughter #1, Martha, who also works here said she and her husband had just kidnapped their young rooster (or would that be chick-napped?) and were bringing it to a nearby farm because it was causing a ruckus in their neighborhood. A first for her! Learning Morse Code. It's not yet second nature for me and I must pay close attention to each character. I've learned that if I don't recognize a character right away I need to let it go and just listen for the next one. If I try to get each character perfect, I miss the next few letters while pondering the one I didn't recognize instantly. Then, instead of missing one letter, I miss 5 or 10. Hmm, I sense a metaphor! 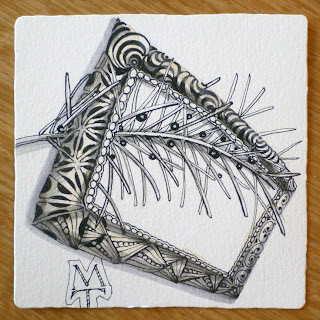 So, what does this have to do with Zentangle? 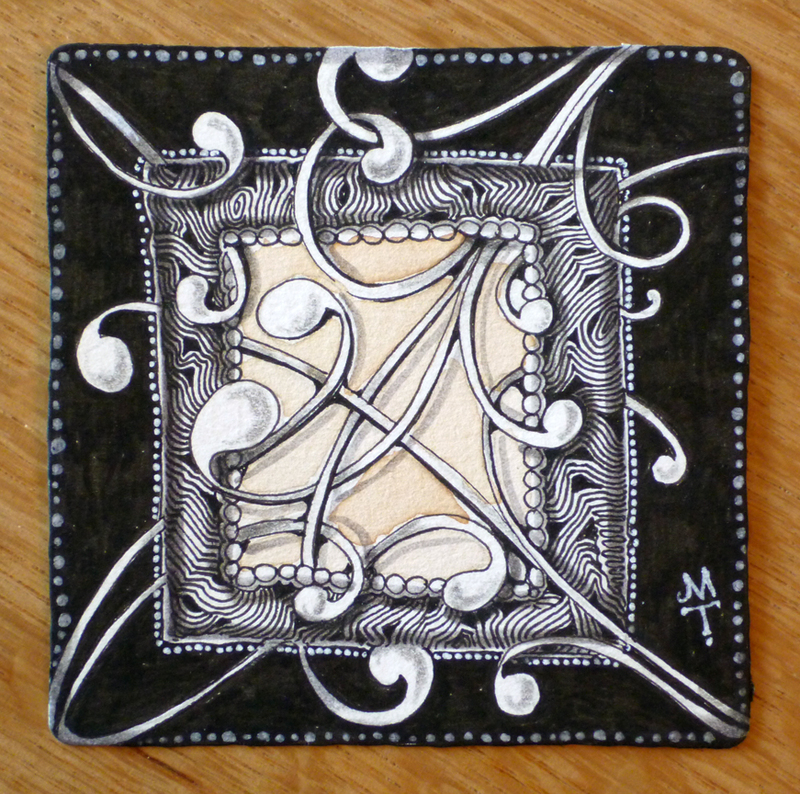 Do you remember the first time you created a Zentangle tile? 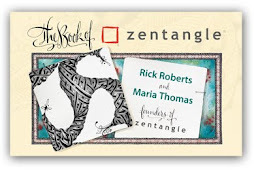 We hear from folks all over the world, saying "I just discovered Zentangle and I am hooked!" It seems to have a very profound effect on people the first time . . . life changing. 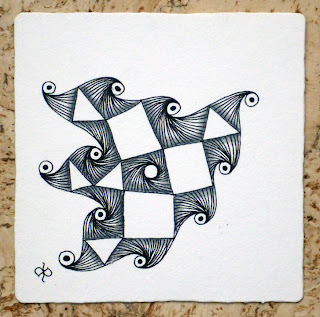 So, dear friends, what was your experience when you experienced Zentangle for the first time? We'd love to hear your stories. For that top mobile, I gathered some of my and Rick's completed square tiles (top), ATC tiles (middle), and Zendala tiles (bottom). 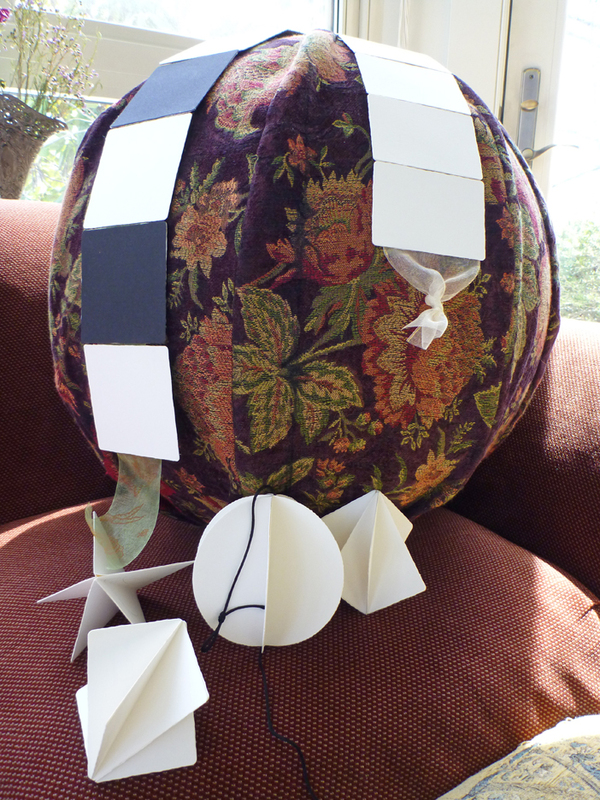 I folded them in half and then stuck their backs together – half of one to half of the ones on either side. 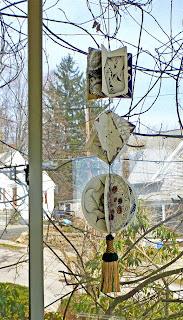 Doing the ATCs was fun because I folded them diagonally and they formed a new pattern as they came together. 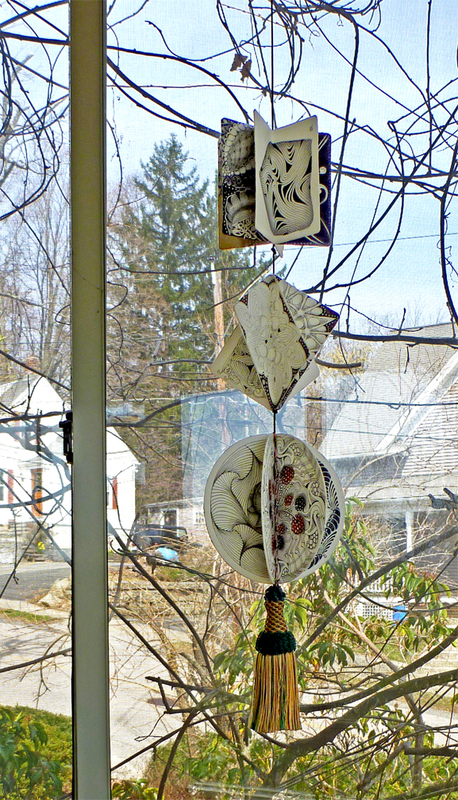 I'm looking forward to when we can open our porch windows and watch this spin in the breeze! We'll send one of our commenters one of these blank ones which I made with double-sided tape, ribbon, string, and Zentangle tiles. I am not sure I have a lot new to say about this, as it's a continuation from our last blog, but I just can't stop tangling about it! 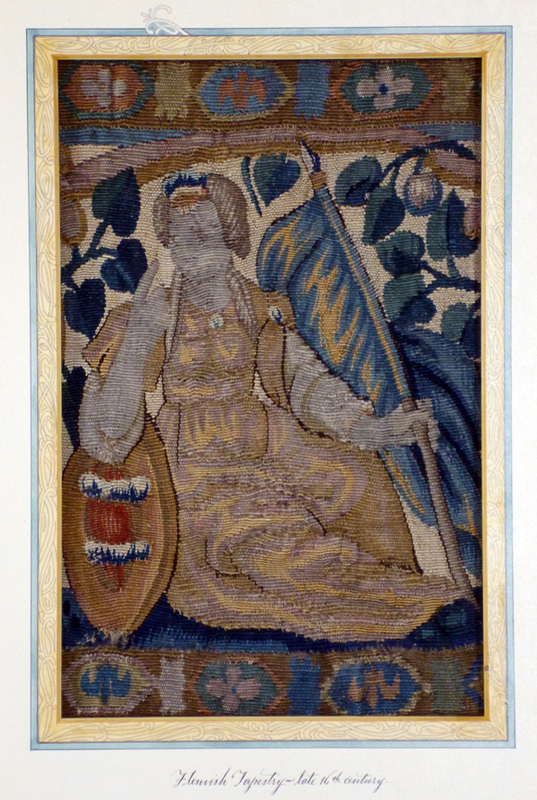 Next time you are at a museum, take special care to notice the frames and mats – those burled wood and gilded moldings; those inner frame liners and gold French mat lines; the marbled details and delicate hangers; the custom carvings and verdigris finishes. 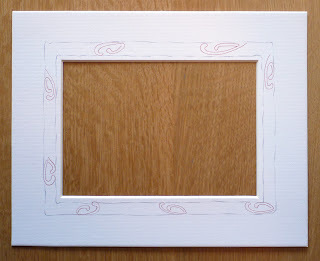 After you notice those frames created by other artists and craftspersons who are specialists in presentation, design and preservation, notice the artistry that frames those frames! Appreciate the artistry of those who designed the space so that you look at a painting the very best way – the lighting and layout of the exhibit, the proportions of the room, the colors on the walls, the typography of the descriptions, the floors, window designs, the benches to sit on so you can rest as you appreciate your favorite painting. All this art to support appreciating art. How cool is that! 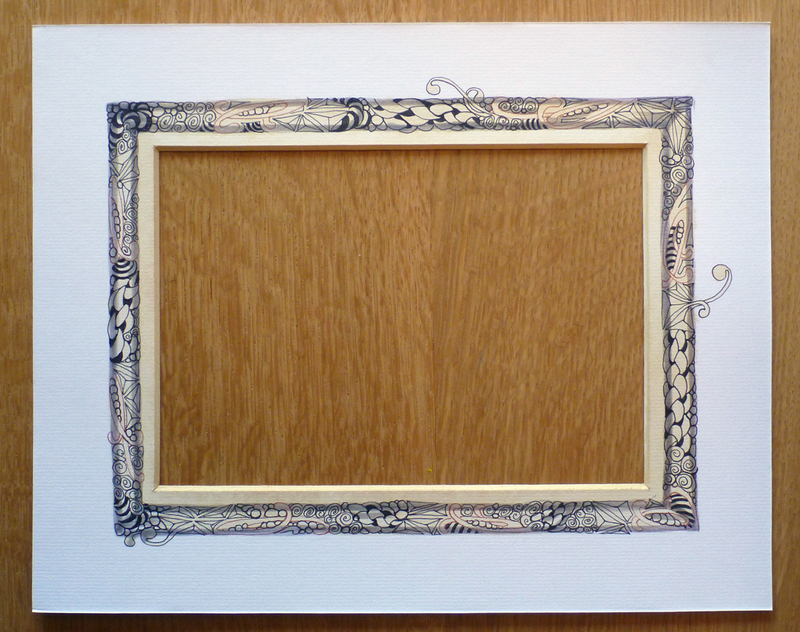 Those frames go on like infinite Russian nesting dolls – with no apparent end to the larger, or the smaller. That gallery is framed by a museum, which is framed by a city layout, which is framed by a geography, which is framed by a continent, then planet, then patterns of planets tracing celestial tangles one orbit at a time, framing . . .
And that painting frames colors, framing brush strokes, framing chemical bonds, framing molecules, framing atoms, framing electrons tracing their tangles one orbit at a time, framing . . .
All in an elegant presentation of lighting and dimension, proportion and perspective – such a beautiful wonder to behold. How does a trip to a museum or gallery inspire you? 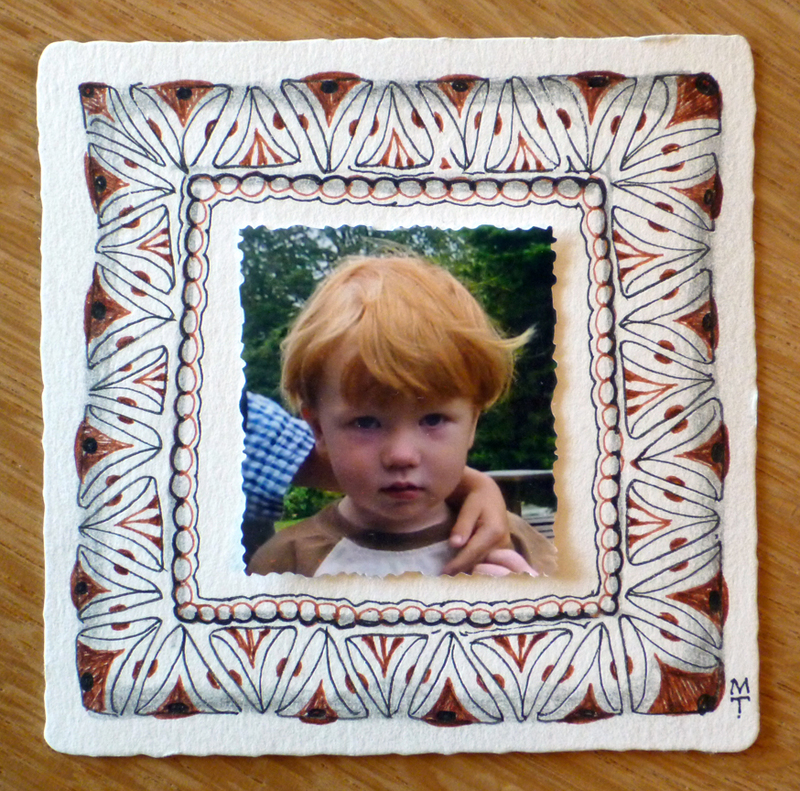 Let us know by commenting below and we'll pick one randomly to receive one of this blog's tiles. 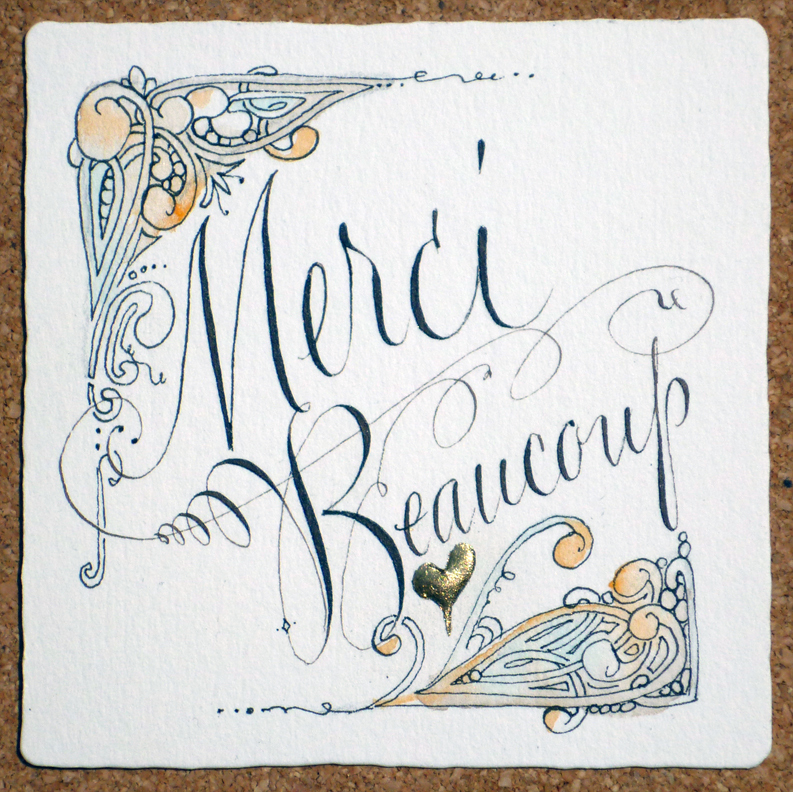 Congrat's to Joy Dolan, who received our previous blog's give-away! 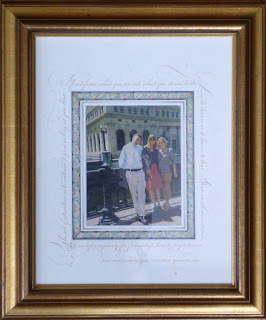 Most of you know that I am a passionate picture framer. My family had a frame shop/art supply store/gallery years ago. It was there that I learned the importance and value of good presentation of one's art. 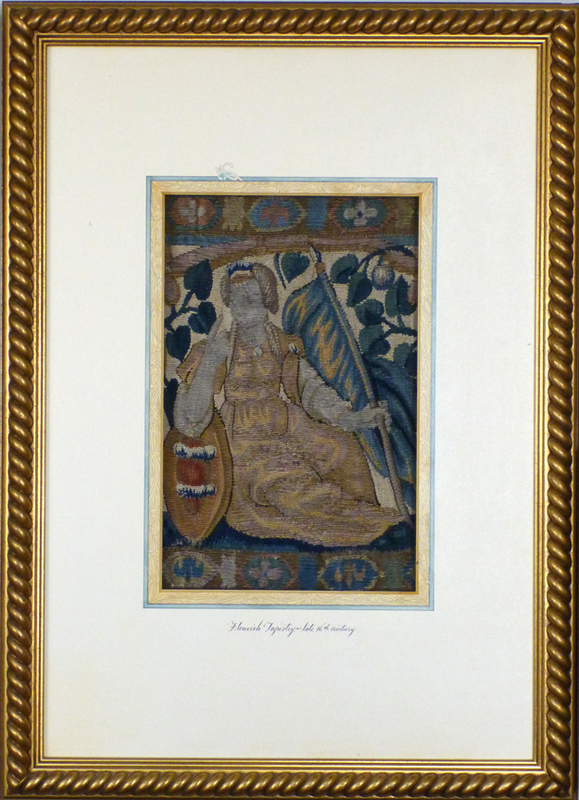 I continue to marvel at the moulding designs and textures, the colors and subtle details. Working at "Chamberlain's" (the name of our store) was like working at a candy store (that is, if I actually did like candy, which I don't, so maybe I should say "was like working at an Italian restaurant". . . but, I digress). Many days were spent planning the framing and matting of my works (mostly calligraphy, some water colors) and I had the luck of being able to choose pretty much anything. 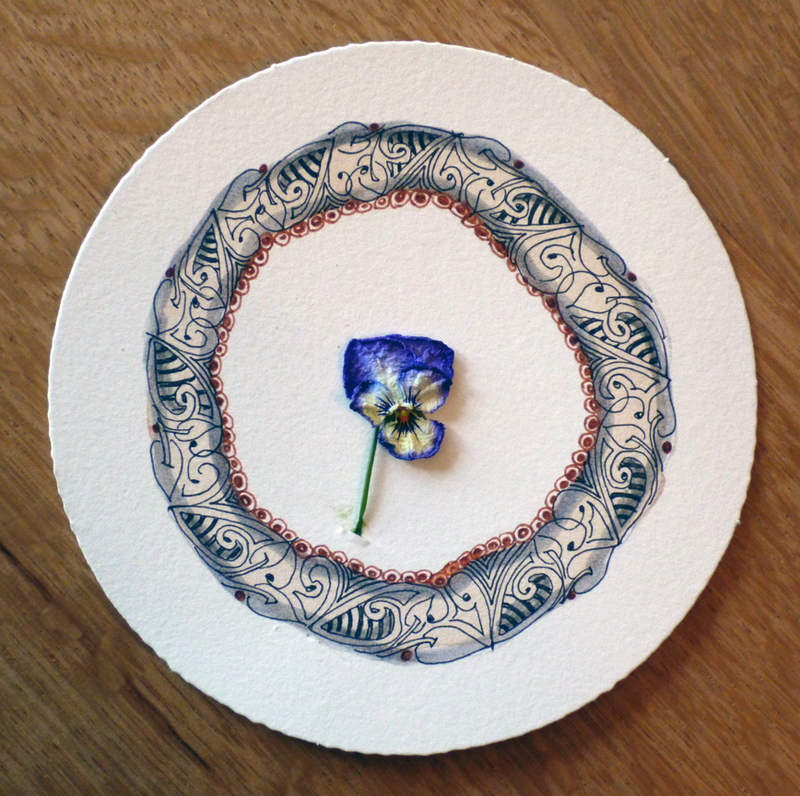 But I did not abuse this and I work well with found objects. 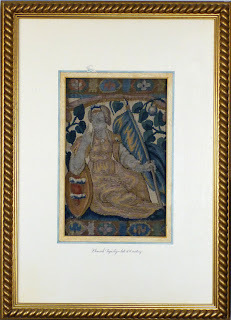 I would use the bits and pieces of partial mats and old frame mouldings and antique frames found at yard sales, and see what would happen. 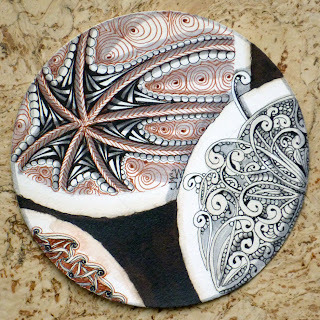 I would create hand-painted borders on my mats, with multiple layers of whites and ecru mats, creating a deep, lush presentation. 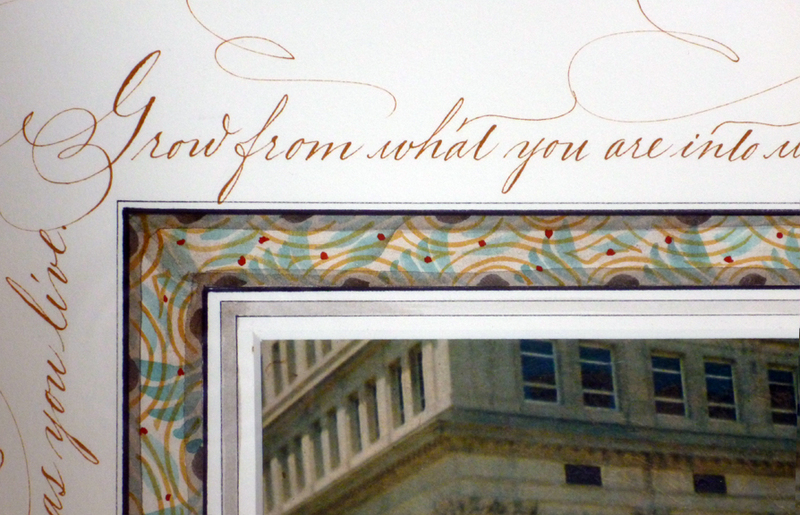 Sometimes I would add small strips of hand-marbled paper in an old-world fashion. But, more often than not, it was the hand-painted ones that our customers asked for. 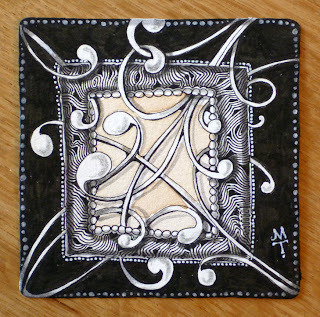 If I were to describe them today, it would be "Zentangle-style French mat" done with brush and water color. 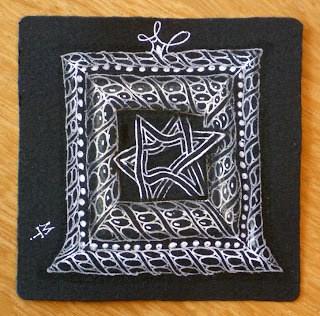 Here are two examples from BZ (before Zentangle). 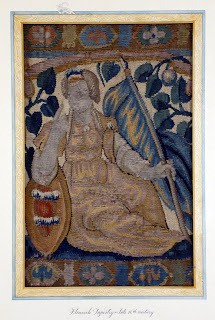 This first one is a frame I did for tapestry piece that I found converted into a pillow. Such fun. Of course now, I just tangle away! 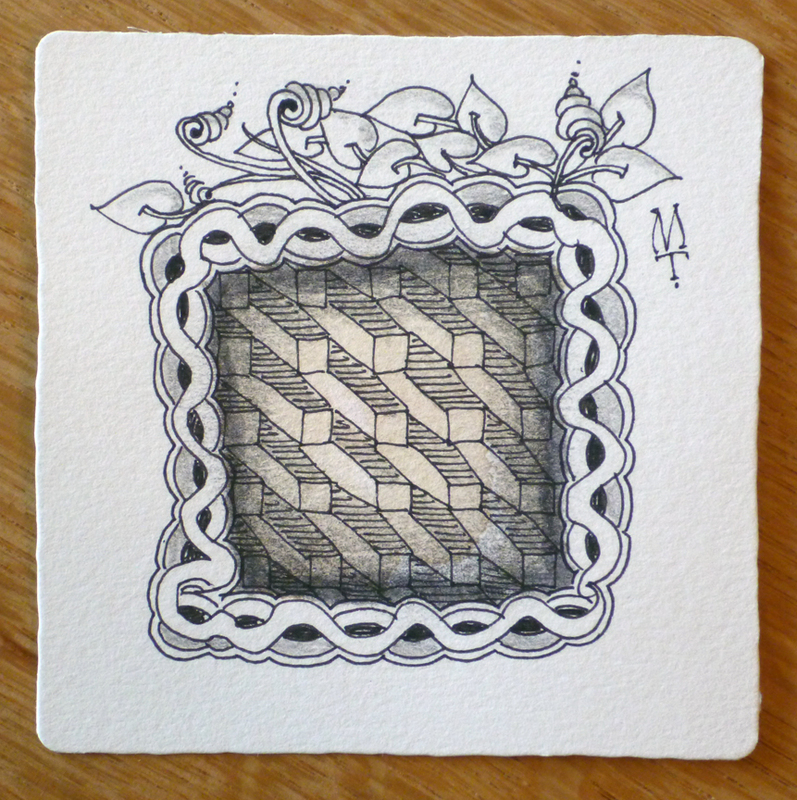 If you can tangle . . . you can border. It's neat to notice the seed forms of mooka and crescent moon in Maria's bordering on those mats. There are a few ways you can go about this, with rulers, pencils and erasers; but come on . . . you guys know how I feel about those! Let's try (just this once, I promise) in a more freeform style. I had some pre-cut 8 x 10 mats, hand drew a (rather wobbly) line about 1/4" from the inside cut. Then another subtly-wobbled line about 1/2" out from the first. (Of course this could be smaller or bigger, depending on the size of your mat.) You have created your "String" for your border. You can tangle it a couple of different ways. In this example, (you can see I began with brown ink so you can see it later) I started by drawing a few simple mookas around leaving spaces, not worrying about the spaces being perfectly even. Then I added some punzel next to each mooka, then some tripoli next to each punzel . . . etc. When everything seems to be filling nicely, I finish it off filling the odd spaces with perfs or printemps ("spring" shaped spirals), a bit of striping . . . and voila: border! Next is the frosting on the cake. With a pencil, grey marker or a brush with some watery gray color, shade the outer edges, both sides, and watch your border pop. So professional of you! The wobbly-ness disappears and is replaced with a softness that a ruler can only dream of. a lock of baby hair or. . maybe even, no wait, wait! how about . . . a Zentangle! So dear tanglers, have some fun with this. Even if you don't frame them. 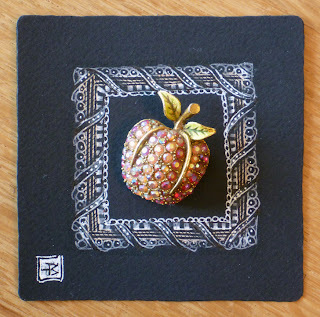 . . just make your border on a Zentangle tile and clip a photo, getting rid of the "too much background" that we all are guilty of in our photos. . . . and you have a fabulous piece to cherish or give away! AND, speaking of give away . 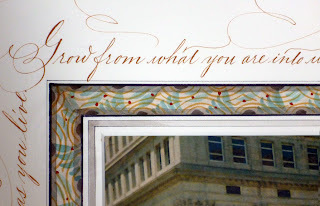 . . let's hear what you have to add to this and I would love to give away the mat in this blog (8 x 10") to one of our commenters. Be sure I can contact you somehow!